Specifically developed for industries such as dairies and water bottling plants in harsh environments. 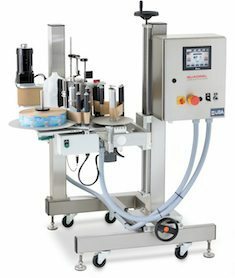 This dairy labeling system precisely and reliably applies side-panel labels to various sizes of rectangular products at speeds up to 300 products per minute. This labeling system comes standard with a servo driven label applicator and color touchscreen HMI. The H-base stand has vertical and horizontal lead screw adjustments and a stainless steel support for easy positioning above an existing conveyor.